Manufacturing headlines from across the country and around the world. Click here for news, trends and assembly technologies specific to the aerospace, automotive, appliance and medical device industries. Our advertisers explain how their technologies can improve your product or assembly line. Click here to get the latest information on fastening, bonding, welding, automation and other assembly technologies. Click here for case histories and technological information from leading industry experts. Click here to browse ASSEMBLY magazine's exclusive studies of the U.S. manufacturing landscape. 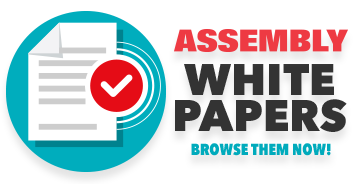 Click here to browse informative reports from our advertisers on new assembly technologies. Click here each week for a brief description of a new and innovative assembly technology. An InfoCenter, brought to you by IDS. New & Noteworthy products for the assembly and manufacturing industry.